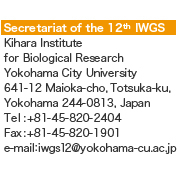 The 12th International Wheat Genetics Symposium (IWGS) will be held on September, 2013 in Yokohama, Japan. IWGS is a regularly scheduled conference for wheat genetics and breeding science. IWGS has been conducted every five years since 1958 with around 400 participants across the world. International researchers exchange information with their latest research for wheat genetics, genomics, gene function, evolution, genetic resources and breeding for sustainable wheat production. Wheat is most widely growing crop worldwide as a staple food. The 12th IWGS has been promoting latest research outcomes and discussion for wheat genetics, breeding and biodiversity to contribute the food chain issues. Worldwide food crisis and climate change on the food chain are common threats to all humankind. The 12th IWGS has endeavored to lead the science of wheat research for development to save the world from the starvation such like the Green revolution. Research outcomes and sustain links of researchers based on genome sequence information and transgenic plants will be also discussed. All participants are on the verge of a phase to concentrate the wisdom of science to challenge the global threat at the coming of age of the wheat genome sequence. It can open windows for sustain links of international collaborative research.